Image © Renegade Arts Entertainment, Gordon Rennie & Paul Holden. Publisher Alexander Finbow was kind enough to send me these, and I enjoyed reading them. The concept is something of a mix of Indiana Jones action adventure and Lovecraftian horror. I have to admit I didn’t find the monsters inside to be very scary. For one thing, I’m old, and I’ve seen drawings of a lot of monsters. For another, even the characters don’t seem very scared of them, so it’s hard as a reader to be so. When I first read Lovecraft as a teenager, his stories really creeped me out because they were so alien and inhuman, but over time Lovecraft has permeated our culture, and now his ideas have become nearly as used and familiar as Dracula and Frankenstein’s creature. 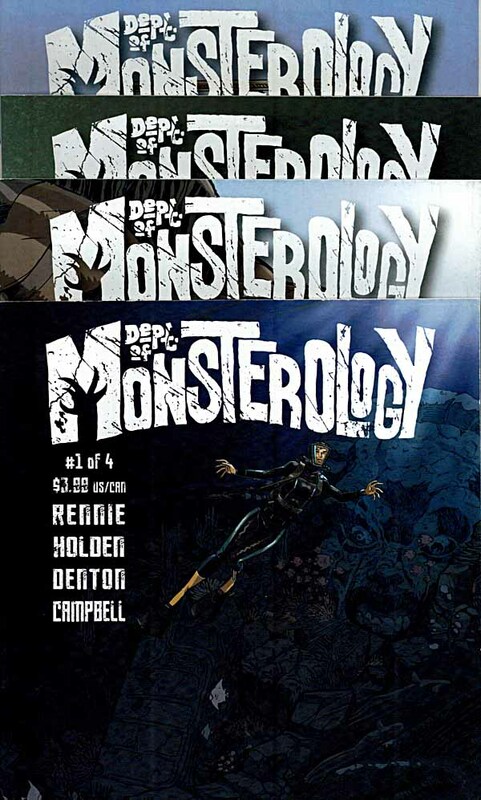 The comics include the monster-hunting adventures of several teams, and each team has unique and interesting members. Their back stories are just beginning to unfold behind the action plots, but they work well so far, as teams, and as characters. Probably the scariest thing in the books is the repulsive but human opponents of these teams, Jocasta and Sebastian Lamont. They’re the real monsters within. This entry was posted in Comics, Reviews on November 4, 2014 by Todd.